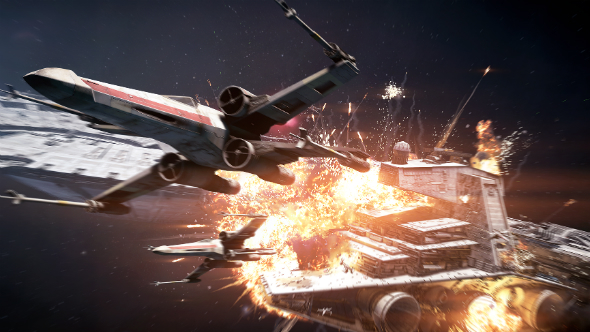 A new game mode for Star Wars Battlefront II has been leaked, and is supposedly called “Titan.” While there aren’t any details for the mode as of yet, it’s notably the same name as a mode from DICE’s earlier game Battlefield 2142 – where players had to protect or destroy a Titan, a massive floating gunship. It’s entirely possible that DICE is planning a Star Wars version of the Battlefield 2142 mode, for inclusion in a later update for Battlefront II. In the original mode, one team was tasked with protecting the massive flying vessel, while the opposing team sought to destroy it – using missiles launched from silos, and finally by boarding it. A Star Wars version of the mode would be intriguing, and not impossible to imagine. Replace the Titan with a Star Destroyer, a Rebel cruiser, a First Order Dreadnought etc, and have the other team manning turbolaser batteries and ion cannons – before finishing in a fight in the corridors? That sounds exciting, and would be a good companion to the ground-based Galactic Assault mode, or the multi-part Death Star map from Battlefront 1. The leak was posted by user Fake_Mophead on Reddit, clearly showing a new mode called “Titan” in the game files for Star Wars Battlefront II, alongside the previous game modes – even temporary ones like Jetpack Cargo and Ewok Hunt. The idea of the new mode being based on Battlefield 2142’s Titan mode is supported by Design Director Dennis Brannvell’s hints for the future of the game offered at E3, where he promised “a new large-scale multiplayer sandbox experience – focused around capturing command posts and attacking and taking out capital ships.” This sounds a lot like a variation on Titan mode. While right now Star Wars Battlefront 2 players are focused on the Clone Wars expansion, which just launched at the end of November, the team at DICE are presumably looking to the next update to keep player excitement going – despite the recent release of Battlefield V. A mode like Titan would certainly do the trick, and may even get lapsed players back into Battlefront II.